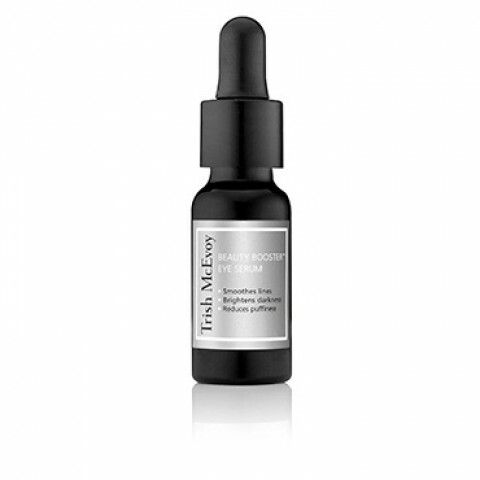 Trish McEvoy's Beauty Booster® Eye Serum is a concentrated eye treatment formulated to drastically reduce the appearance of fine lines, dark circles and puffiness. This water-light serum deeply hydrates, brightens and firms with a powerful cocktail of peptides, hyaluronic acid vitamins and antioxidants. With continued use the under-eye area will appear less lined, smoother, firmer and brighter. I keep coming back to this eye cream because it is reasonably priced, super hydrating, and totally wakes up tired eyes in the morning. I use it twice a day and have actually seen my husband borrowing it too! It is not a miracle cream but I do note an improvement in puffiness after using it in the morning and it helps with dark circles too. Good enough for me to purchase it repeatedly over the last few years. One of the few eye serums that is chock full of peptides and actually diminishes fine lines around my eyes! Great watery consistency means fast absorption. Highly recommend!